AccuWeather Global Weather Center — April 24, 2018 — AccuWeather reports Old Man Winter’s reluctance to “give it up” is largely responsible for the lack of tornadoes counted across part of Tornado Alley so far this year. While tornadoes have occurred in each month of the year so far over the United States, there has not yet been a single tornado confirmed in Oklahoma and Kansas in 2018. Respectively, Kansas and Oklahoma average about 13 and 14 tornadoes per year during April. From January through April, Kansas and Oklahoma average both average close to 19 tornadoes. The latest start to the tornado season in Oklahoma was on April 26, 1962. This means there were no tornadoes in January, February, March and nearly the first four weeks of April in 1962. If Oklahoma manages to finish April without a tornado, it will join two other years when no tornadoes occurred during the month. These years were in 1987 and 1988. Daily tornado records date back to 1950. On April 13, there were a few tornado reports (preliminary) in Missouri and near the borders of Texas and Arkansas. However, these tornadoes occurred outside of Oklahoma and Kansas state borders. Frequent rounds of chilly air from Canada, thanks to a persistent southward dip in the jet stream over the eastern U.S., helped to keep temperature and humidity surges to a minimum. AccuWeather Storm Warning Meteorologist Richard Schraeger. The storms were far removed from any moisture and warmth in the Deep South and brought many rounds of snow to the Northern states. Severe thunderstorms need the right blend of warmth and moisture near the ground and cool and dry air aloft, combined with strong shifting winds at different levels of the atmosphere. Large southern storm systems tend to bring these conditions together during March and April. As of April 22, Wichita is averaging close to 8 degrees Fahrenheit below average for the month. Below-average April temperatures have extended across much of the eastern two-thirds of the nation, including some double-digit temperature departures over the Upper Midwest. Will there be an uptick in severe weather, tornadoes? There is the potential for locally strong thunderstorms in parts of Oklahoma and Kansas on Wednesday afternoon and evening and perhaps again on Thursday. However, the greatest threat from the mid- to late-week storms may be spotty hail, rather than tornadoes. This does not mean the rest of the season will be void of tornadoes in Kansas and Oklahoma. 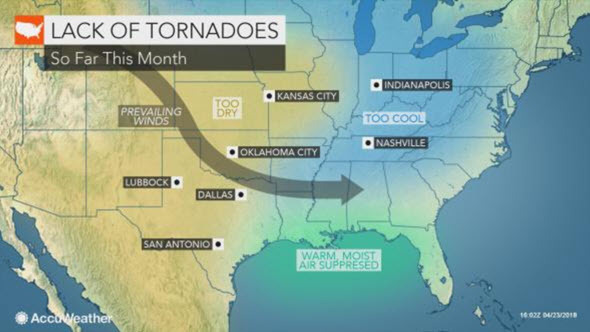 A widespread severe thunderstorm event, including the risk of tornadoes, may unfold in Oklahoma, Kansas and much of the Plains, South and Midwest at the very end of April and into the first few days of May. The large-scale risk of severe weather would coincide with a surge of warmth and humidity over the Central and Eastern states as a storm travels from the Rockies to the Upper Midwest. During May, the potential for tornadoes typically expands northward and eastward as warm, humid air gains more ground.